Once again, the United States is spending hundreds of billions of dollars to bring Matt Damon home. Damon reprises his most well-known archetype as the lost hero from Saving Private Ryan and Interstellar in The Martian. Directed by Ridley Scott, The Martian is a well-directed, beautifully shot and superbly acted piece of art. The premise of the movie is basically Cast Away on another planet. 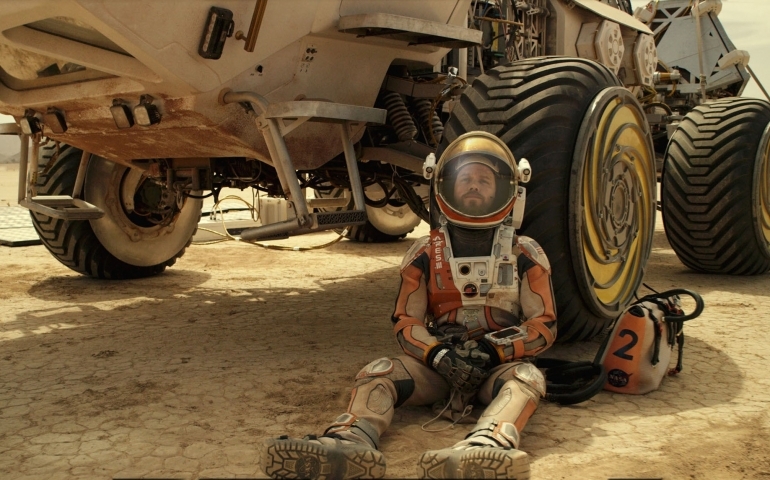 Mark Watney, played by Damon, is stuck on the red planet after a piece of debris strikes him during a violent storm. Commander of the team Melissa Lewis, played by Jessica Chastain, is forced to leave him behind. Refusing to accept defeat and death, Watney does all he can to survive on a planet that is near impossible to live on. Meanwhile, the director of NASA, played by Jeff Daniels, is pulling out all the stops to find a way to save Watney. Every actor in the movie is putting out their best performance possible. Damon carries the majority of the film and makes us connect with his character through his humor and wit. Jessica Chastain plays a no-nonsense leader, which works incredibly because this is essentially the same part that moviegoers see her play in all of her films. Also, there are two actors that do an exceptionally impressive job of playing the top authorities at NASA, and they are Jeff Daniels and Chiwetel Ejiofor. Daniels brings forth a very serious and imposing figure, a far cry from his Dumb and Dumber days. Concerning Ejiofor, it seems as if this man can do any role. After getting an Oscar nod for his defining role in 12 Years a Slave, Ejiofor is gunning for a Best Supporting Actor Oscar. Another great aspect of the movie is the look. The cinematography of this film is amazing. The many sweeping shots of the landscapes make you believe that you are on Mars. Of course no one literally went and shot the planet and its landscapes, but it makes you realize how both hostile and beautiful Mars is. The surprising aspect of this film is its comedy. The publicity of the film built it up as an gritty and bleak epic; while it is an epic, it works in a lot of really funny lines. This is to the film’s advantage. It gives the movie a real sense of humanity, unlike the boring sticks in the mud you experience in a M. Night Shyamalan movie. On a side note, if you are a Lord of the Rings fan, there is a moment in the film that will have you rolling on the floor laughing, which will make the movie for you. One has to really nitpick in order to find anything wrong with this movie, and there are a few small problems. For instance, the movie forces the audience to jump right in. There really is no backstory on anyone, and Scott decides to use a Michael Bay move by giving the viewer a very intense scene right in the first seven minutes. The other minor problem is there is a lot of science “mumbo jumbo” that does not make a whole lot of sense in the beginning. The film gets better at explaining its logic as it goes on, but if it confuses the viewer at the very start of the movie it could lose a few audience members. So in the end, The Martian is a very impressive film. The environment is a spectacle to behold and the acting is spot on. If you can think through some scientific nonsense, you will very much enjoy this film. I highly recommend it, and I would give it an 8 on a scale from 1 to 10.